The moment a girl's life was put at risk after being pushed under a moving bus by a friend has been captured on camera leaving many people in shock. 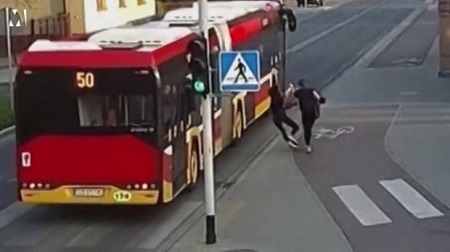 Security cameras caught the terrifying moment a teenage girl was pushed into the path of an oncoming bus by her friend in a prank gone wrong, according to a report by Metro UK. 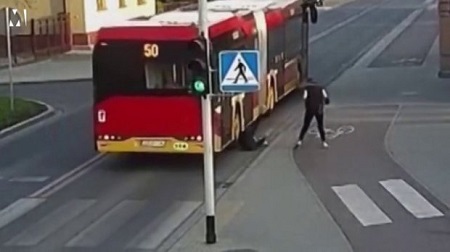 Police released footage showing how close the 17-year-old came to being crushed by the wheel of the bus as she fell into the road in Czechowice-Dziedzice, Poland. Her head is just inches away from the back wheel as the bus drives past her. She manages to get back up quickly and is comforted by her friend after the horrifying ordeal. Clearly horrified, the other woman puts her hand over her mouth as soon as she realises what she has done. Moments later, a man in a white car pulls over to check on the victim, who police say suffered only minor injuries in the near-miss. Police say they have now fined the the girl responsible for pushing the victim over. Charges are being considered, they said. Last year a mystery jogger shoved a woman into the path of a double-decker bus on Putney Bridge. Bus driver Oliver Salbris was forced to swerve out of the way so as not to crush the woman’s head after she was pushed into his path. Nicknamed the ‘Putney Pusher’, the man responsible has still not been found by police despite CCTV capturing the random attack.